In our house we have a sourdough starter (or leaven). In fact we have two. Part of the whole process in keeping it 'alive' is that every so often you have to halve it, add more flour and water and get rid of the other half. Since we hate wasting anything we kept the last lot to make pancakes with. I'm sure at some point OH will say more about sourdough bread and starers - he has many thoughts on this that I feel sure he's keen to share. The starter is like having another pet, it has to be looked after, fed and not left out in the cold. So using 'Son of Sourdough' I knocked up some pancakes for our breakfast while OH made today's bread orders. I used a recipe from the Herbert Brothers from The Guardian. Frankly, neither I nor OH were fans of their recent Channel 4 show, and the whole post-Jamie Oliver, lads cooking stuff I could totally live without. However, sourdough pancake recipes were a bit thin on the Google search ground. It made a nice batter but to be honest I could do with a bit of detail. The only person I let off detail in a recipe is Nigel Slater. So I'll give you my tips. Once you've made up the batter as per the Herbert's instructions, the recipe could do with a suggested pan size, as you don't really have any idea how big or thick these babies should be. I used my trusted omelette pan and made them to the diameter of the pan. 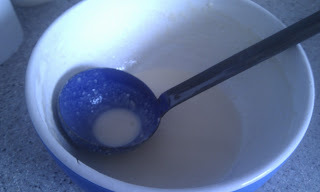 This meant using around two thirds of a ladle of batter (have included a picture of my ladle if that is at all handy!). I added the batter to the pan and gave it a swirl around so it coated the base. 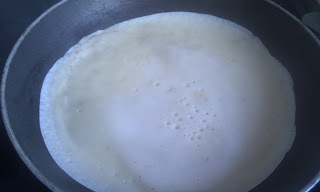 When I make pancakes of the usual variety (not with Son of Sourdough) I have a pan of simmering water on the go with a plate over it to keep the pancakes warm while I make the rest. Then I just stack the pancakes up and cover them over with a clean teatowel or some foil. Delia taught me this little tip in her Complete Cookery Course - see Herberts that's how you write a recipe, little things like that make all the difference! 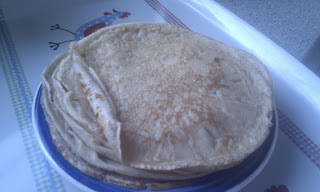 I gave each pancake around 30 seconds (but keep an eye on them!) and turned them over (no flipping, I like a palette knife for this job). And give them a little less on the other side. The Herbert quantity makes around 11 or 12 pancakes of this size (wasn't sure of the actual number as Project A thought she'd had four and I thought she'd had three!). 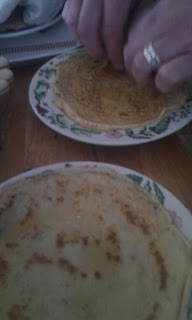 We had these with the choice of syrup (or as Project A called it when she was small Cyril) or honey. I liked honey as it's sweetness and floral flavour (get me!) works well against the slight sourness. Apologies for the photography, it was really early! 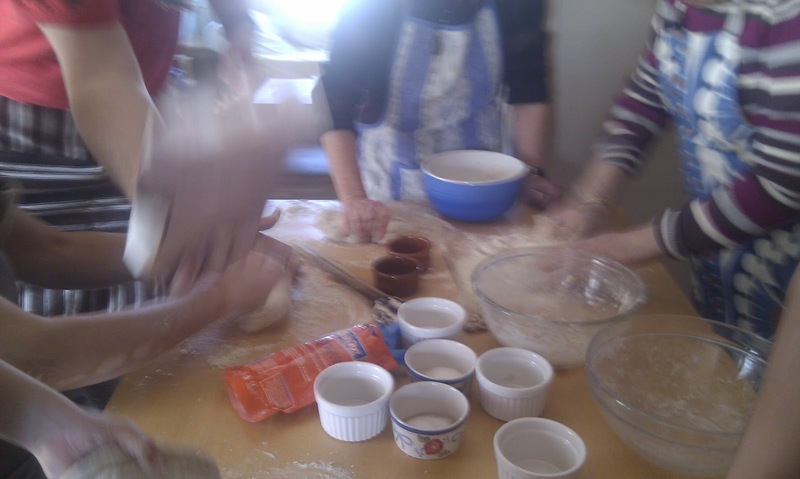 Save dough by making dough! Don't just sit around drinking endless beers and listening to the same old stories! 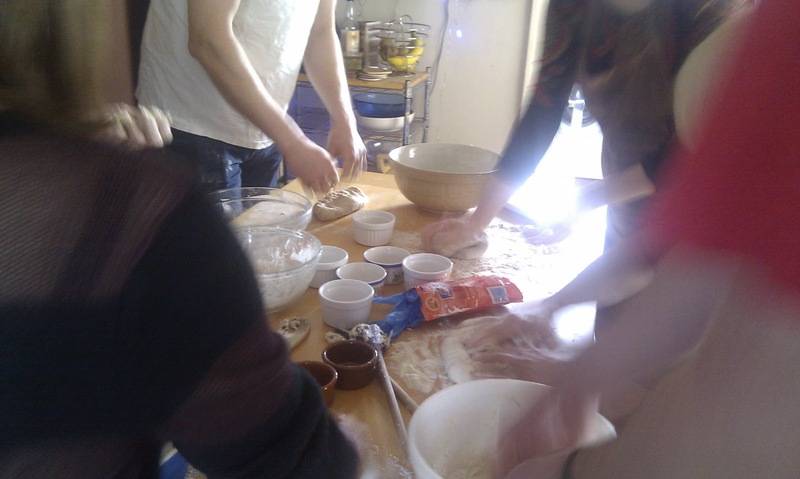 Get some strong flour, bowls, yeast and off you go - baking party! Give prizes for best loaf, or worst rolls (if you feel mean). After initial knead, have some grub, then back to table every hour until dough has finished proving (either two or three hours - depends how long you want people to stay) then into oven - ping! Really enjoyable! Four onto one does go! Couldn't resist sharing this. I put four 450g white loaves onto one pizza stone and they've merged into each other. I love it, but hated to split them up! I can't believe how quickly this week's gone - meant to post more this week too! The week started with sourdough pancakes for Sunday breakfast, (my first attempt and my advice is to make sure you've got lots of sourdough as batter before starting!) followed by foccacia for lunch (served with OH's lovely homemade lasagne). Very straightforward - recipe owed entirely to Daniel Stevens' fantastic Bread book. This makes one large foccacia. Grab the biggest bowl you've got and combine the flour, yeast, salt, water and oil, turn out onto a clean work surface and knead for 10 minutes. Shape into a round, (I'll go into this in another post - sorry! ), coat with a dash more olive oil and pop it back into the bowl, covered with a clean/new bin bag. No need to worry about radiators - the bag will do the job. Just make sure it's folded underneath the bowl. Leave for at least one hour, maybe as much as an hour and a half. No peaking! Oven on now. As high as she can go! Okay, it should have doubled in size by now. 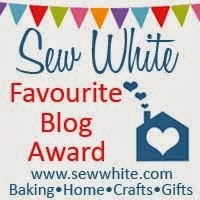 Tip it onto an oiled shallow baking tray and shape the dough to fir the tray (ie carefully press/stretch the dough to form a rectangle on the tray, right into the corners). Loosely cover with the bin bag and leave for half an hour. After this time, you can get medieval on the dough. Fingertips in, making deep holes all over. 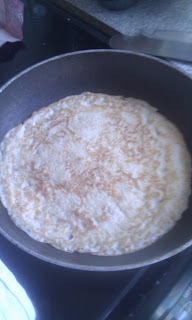 Don't rip it and try not to get too near the bottom of the dough, but it should be puffed up so I reckon it can take it! Drizzle some olive oil, or rosemary oil over it, bit of salt and the rosemary sprigs. Get that into the oven at full temp for 10 minutes and whack on that Dean Martin CD. Enjoy, but let it cool for a few minutes if you can bear it! Great as a sandwich the following day! I was looking to use up some bits and pieces I had left over from a couple of other recipes and as it was my turn to buy the biscuits for the Publishing team corner, I decided to make some. I also made some for Project A and Cat botherer minus the nuts. So here it is, with a slight apology to Rachel Allen for using her original cookie recipe from 'Bake' for inspiration. The basics are hers, the adornments are mine. 2. Cream the butter and sugar together (you can use a food mixer or electric whisk but I think if you are making something like this you have to use wooden-spoon power in preparation for the calories you'll later consume!). 3. Add the rest of the ingredients, start by mixing with a spoon and then get your hands in to bring it together to a large ball of well mixed, firm-ish dough. 4. Break small pieces off and roll to around the size of a walnut. Put the walnut-sized balls of dough onto a couple of baking trays (the joy of using so much butter is you won't have to grease them - result!). 5. The redoubtable Ms Allen says this makes around 35 cookies - I got around 24 - maybe my idea of a walnut is bigger than hers. 6. Once you have all the little balls of dough on the trays, flatten them down a little with the back of a damp fork. 7. Bake for around 15 minutes, although my fan oven is a little over-excitable and I checked after 10, then gave it a couple of minutes more. 8. Remove from the oven and put the cookies (carefully) on a cooling rack to crisp up. 9. Sit back and admire your efforts with a glass of wine (and a cookie!). Hello from OH! My first post, but my second week at market. This time I made small wholemeal loaves, small white loaves and bread rolls. The picture shows the wholemeal, which, in all honesty, were more photogenic than the white loaves - more of a tan! In all I made eight loaves and twenty rolls, starting at 5am and finishing packaging by 1pm. Luckily I had my youngest daughter for assistance - invaluable! The rolls took forever as we bought some digital scales yesterday and I was determined that each one would be the same as the others. It worked but my back doesn't!